I binge-read all of Rachel Hawkins’ books last spring and absolutely loved the Hex Hall series. As a result, I perhaps didn’t give REBEL BELLE as much credit, although I did include it in a round-up of books you should check out. 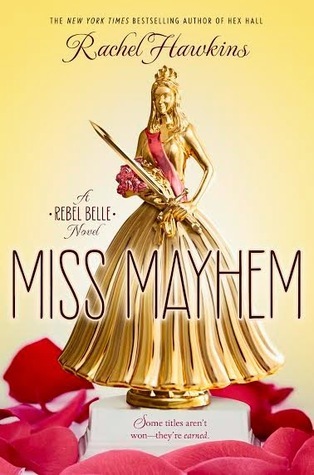 After a year without any new Rachel Hawkins books to read, MISS MAYHEM was a complete delight, so I will give it the full review it deserves. If you haven’t read REBEL BELLE, the following description and review will include spoilers for it, so you should STOP READING NOW. Life is almost back to normal for Harper Price. The Ephors have been silent after their deadly attack at Cotillion months ago, and her best friend Bee has returned after a mysterious disappearance. Now Harper can return her focus to the important things in life: school, canoodling with David, her nemesis-turned-ward-slash-boyfie, and even competing in the Miss Pine Grove pageant. Unfortunately, supernatural chores are never done. The Ephors have decided they’d rather train David than kill him. The catch: Harper has to come along for the ride, but she can’t stay David’s Paladin unless she undergoes an ancient trial that will either kill her . . . or connect her to David for life. 1. The premise – Since I didn’t give a full review of the first book, I’ll start with the premise. I liked how it wasn’t the typical Chosen One storyline. Harper didn’t inherit the Paladin powers–they were transferred to her as the previous Paladin died. Also, these books have a definite Buffy vibe. There’s even a Scooby Doo reference in this one :). 2. The voice – I love Rachel Hawkins’ writing in general, but Harper’s voice in particular has a Southern humor to it that is just perfect. Here’s a sample from when she and her friends are at a fair. Don’t you just get such a great sense of her personality from this one sentence? 3. The descriptions – This goes along with the voice a bit, but I also really love the descriptions of other characters. It’s never just a simple description, which is why I said it goes with the voice, but tells something about Harper, too. 4. The drama – Oh, the drama! Spoiler alert if you ignored my other one. At the end of the first book, her just-dumped boyfriend absorbed the powers of the Mage, making up the third corner of the triangle with Harper and her new boyfriend, David. Talk about awkward! I loved watching how this played out, particularly as new characters made it into more of a rhombus. The emotions involved were very believable and not over-dramatized at all, despite the fact that I called this point “the drama” :). 5. The ending – So, the ending is the one thing I commented on when I did that round-up that included the first book, and Miss Hawkins has done it again with this one, delivering an ending that completely changes everything in the story world. I have no idea what’s coming in the third book, but I can’t wait to find out! Unfortunately, I picked this book up the week it released, so I’ll have to wait a whole year :(. So it goes. Have you read MISS MAYHEM yet? Tell me what you thought! MMGM: I SO DON’T DO MYSTERIES by Barrie Summy with a giveaway! I promised you all that I would do my first giveaway from my Scholastic Warehouse Sale haul in the New Year, so I’m excited to kick off my first MMGM of 2014 with exactly that. The details are at the bottom of the post. I picked up I SO DON’T DO MYSTERIES by Barrie Summy completely based on the back cover copy. I hadn’t heard of this series before then. Sherry (short for Sherlock) Holmes Baldwin is spending spring break in California with her best friend, Junie. She can’t wait to hang out in the sun, hit the mall, and spend time with cutie-pie Josh. Then … a freaky change of plans. Sherry’s mom, a cop killed in the line of duty, contacts her. Not only is she a ghost, she’s a ghost in danger of flunking out of the Academy of Spirits, and she needs Sherry’s help. Unless she solves an important mystery in San Diego, she’ll be banished to an afterlife for ghost failures! If Sherry wants to be a normal seventh grader (as in, one who doesn’t communicate with ghosts), she can’t tell anybody about her mom–or what she has to do. Not her brother, not Junie, and especially not Josh. It’s up to Sherry alone to save the day. Except … she SO doesn’t do mysteries. Here are the five things I loved most about this book. 1. The voice – I have to be honest. When I started reading this, I thought Sherry felt a little old for seventh grade. It had to do with the way she talked about her crush. I think this is why 13 is a hard age in middle grade. She’s a teenager, but there’s still a lot of child in her, too. The further I got into the book, the more that unique mix fit perfectly for the age. 2. The family dynamics – The above description doesn’t get into the fact that Sherry didn’t have the best relationship with her mom while she was alive or that her dad is getting remarried to one of her teachers. Aside from the thrill of traveling to solve a mystery, she has to come to grips with a lot of real-life issues. They’re not all resolved in this book, and I’m interested to see how those relationships develop in the rest of the series. 3. The mystery – Of course I have to mention the mystery. I admit I figured a lot of it out in advance, but I’m not sure the majority of readers in the target age group would. It was definitely a unique mystery, and I learned something about rhinos in the process. You’ll just have to read it to find out for yourself. 4. The friendship – Friendship is always a major focus in middle grade, and this book is no exception. Sherry and her best friend are at the age where they’re figuring out who they are now and who they want to be, so that brings up some conflict. I liked the way it was handled. 5. Sherry’s descriptions of people – This ties back to the voice, but I got such a sense of Sherry’s character by the way she described the people she encountered. If she didn’t like them, that was very clear in her description. And if her opinion of someone changed, you saw that, too. I really want to give an example here, but if I do it would give away who the villain is, so I won’t. On to the giveaway. It’s for a paperback copy of the book. United States and Canada only. To enter, just leave a comment on this post by noon on Sunday, Jan. 19. I’ll announce the winner next Monday, Jan. 20. Good luck! I read the first book in this series–THE RAVEN BOYS–earlier this year, but when I finished it, I had a hard time putting into words what I liked about it. I think I’ve figured it out, so I’m ready to review the most recent book, THE DREAM THIEVES. While you should read THE RAVEN BOYS first, this review doesn’t contain any spoilers for either. Ronan is one of the raven boys–a group of friends, practically brothers, searching for a dead king named Glendower, who they think is hidden somewhere in the hills by their elite private school, Aglionby Academy. The path to Glendower has long lived as an undercurrent beneath town. But now, like Ronan’s secrets, it is beginning to rise to the surface–changing everything in its wake. Here are the five things I love most, really about both books. 1. Gansey – There’s something so engaging about Gansey, and I love the way Maggie Stiefvater describes his charm. I tried to find a small enough sample to include here, but it’s too hard to nail down with a single paragraph. There’s a scene in the book where Gansey and Adam are at a political event for Gansey’s mother. The way Adam describes Gansey’s interactions with potential donors is a perfect blend of showing and telling the way Gansey not only puts everyone at ease but makes them feel like they have his complete attention and approval. He’s such a richly drawn character. 3. The poetry – Maggie Stiefvater uses a number of poetic devices in her writing. I may have been an English major, but poetry was not my thing, so I can’t even name all of them. There’s a cadence to the writing that is beautiful. Objects aren’t just objects. They come to life through the writing. Like when Gansey glances at a text on his phone and sets it aside, Ronan thinks: “So [the phone] sat there with its eyebrows raised, waiting.” I would never think to write something this way–it’s not my style–but I appreciate the perfectness of it in this book. 4. The craziness – I have to say that about half the time I have no idea what’s going on. There are constantly new clues and plot points being thrown in that don’t fit together right away. And yet I have confidence that they all will in the end, so I file them away and wait for their significance to be revealed. 5. The forbidden romance – The description for this book doesn’t tell you about Blue Sargent, the girl who joined this group of boys in their search in the first book. She lives under a prophecy–or a curse–that when she kisses her true love, he will die. While I don’t think all books need to end happily, I’m hopeful it’s a curse that will be overcome in some way by the end of the third book. It provides for some great romantic tension in this one. I will put a note of caution in here for any of my younger followers that there is a lot of language in this book, mainly due to a character with whom Ronan interacts. Who else is reading this series? What do you love about it? Dahlia has been the resident ghost at Silverton Manor for as long as she can remember. Zipping in and out of rooms and planting her very own ghost garden is fun enough, but she’s always wanted a real friend. Oliver Day can’t wait to see the new mansion his family will be house-sitting. Tired of moving around and having only his pesky siblings to play with, he’s hoping this place can be their home once and for all. When the Days arrive at Silverton Manor, Dahlia can’t wait to see what excitement her new guests will bring! What neither Dahlia nor Oliver realizes is that an unscrupulous ghost hunter and a crooked town councilman are planning to rid the manor of its ghosts and sell it to the highest bidder. With just days to save their home, they must join forces to solve the mystery behind Dahlia’s death many years earlier. 1. The descriptions – The descriptions are so full of imagery. I get a perfect picture of what each character is seeing, and at the same time, they tell me something about the character, too. For example, in the following, Oliver gets his first glimpse of the house, and it tells us as much about him as it does the house. Can’t you just see that smile? 2. The mystery – I found it interesting when I read the acknowledgements that this book started out being only from Dahlia’s point of view. I can see how it evolved from being her story to Oliver’s as well. That’s especially evident with the mystery, which is something she needs to solve but ends up affecting the Day kids as well. I liked the way each character gathered clues and worked together to come up with the final solution. 3. The clever names – I love all the clever names, like the ghosting Ghouncil, and the sly joke about Mrs. Tibbs’ name at the beginning. Kids won’t get it, but it won’t distract them, either. Then there’s the Ghosterminator, Rank T. Wiley, with the ever-changing middle name. 4. The parents – Ms. Paquette is very effective at keeping the parents out of the action without killing them off or having them abandon the kids. They’re present the whole time, but obviously they don’t believe Oliver about the ghosts or Wiley’s true intentions, so that makes it easy for them to stay uninvolved. 5. The ending – I really appreciate it when a book wraps up neatly into a bow. All of the little strings left dangling during the story, from Wiley’s deliberate deception about the work he was supposed to be doing to the supposed curse on the house, all fit together in the end. And yet, the bow wasn’t tied so tightly that it couldn’t be pulled loose again for a sequel. Well done, Ms. Paquette. And here’s another fun note. There was a familiar name in the acknowledgements–my critique partner, Kip Wilson! I love seeing people I know listed in a book. If you haven’t read this one yet, definitely pick it up. If you have, let me know your thoughts in the comments. When I posted about research last week I was in the midst of reading a memoir for the first time ever. I’m definitely a fiction girl, so I would never have picked up this book without a strong incentive. I’m so glad I did. There were enough things about this book I loved that I’m writing my first non-fiction review. How about that? Here’s the description. It’s the countdown to Josh Wolk’s wedding, and he has just one thing left on his to-do list. His fiancee is responsible for the invitations, the menu, and the ceremony. And Josh? At age thirty-four, Josh has to pack his trunk to work as a counselor at his beloved boyhood summer camp. It’s time for one glorious, summer-long farewell to youth and irresponsibility. A tall kid, Josh was always bigger than his fellow campers, but now he’s also as old as their dads, and he has the gray hair to prove it. Even the other counselors think Josh is wizened. For eight hilarious, uncomfortable, enlightening weeks, Josh teaches swimming by day and lives in a cabin of smart-aleck, wet-willie-dispensing fourteen-year-olds at night. Reintegrating himself into his childhood utopia isn’t as easy as he thought it would be when he hatched this plan. His many moments of feeling ancient are paired with the unwelcome return of his old nemesis, Mitch. A macho jack-of-all-extreme sports, Mitch is idolized by the current campers, but he revives every one of Josh’s youthful insecurities and then piles on a few more. Throughout all this disorienting regression, Josh’s telephone conversations with his fiancee, Christine, grow increasing intense as their often comical discussions over the wedding plans become a flimsy cover for her worries that he’s not ready to relinquish his death grip on the past. 1. The humor – I’ve always had this perception that memoirs were about people with sad or horrifying stories. Obviously I was wrong. What makes this book is the humor. Josh’s way of seeing the humor in almost every situation kept me chuckling continually–probably because I like wry, sarcastic humor. He even made the boy humor palatable to me, and that’s something. 3. The descriptions – While the metaphors certainly enhance the descriptions, there’s more to it than that. I could see, hear, smell and hear this camp, along with how he felt about all of those sensory touches. He also made the campers real and familiar. Here’s a brief example. 4. His journey – What he’s really cataloging is that point when you realize it’s time to grow up and let go of the past. You can’t recapture the past. You can catch glimpses of it, but you’re not the same, and places change, too. The camp was an interesting setting for his experiment, though, as it had changed less than other places might have. I really enjoyed seeing what he learned from the experience. 5. The storytelling – What it all comes down to in the end is that this story was told so well. All of the pieces above added up to a great story. So thank you, Josh Wolk, for making my first experience with narrative non-fiction a positive one. I’m not sure I’m ready to jump into reading memoirs on a regular basis, but if you have a recommendation for one you think I’d enjoy, let me know. I highly recommend this one! This morning I finished up revisions from my second round of readers and sent my work-in-progress off to a third round. I’m always amazed at the things I miss when I’m editing my own work, and I came to a definite conclusion. If I didn’t use critique partners and beta readers, my manuscripts would never get past the slushpile. … my MS wouldn’t make any sense. The crazy leaps of logic make perfect sense to me, but that’s because I know all of the backstory I’ve been careful to sprinkle in sparingly. In my earlier manuscripts, I gave too much backstory, but lately I’ve tended the other way. The good news is, I often can fix this issue with a sentence thrown in here or there to explain how or why the character got from point A to point B. Or, in the case of this latest WIP, put a scene back in that I thought I could get away without. When my CP says, “I want to see that happen,” I know it was a bad idea to take it out :). … my MS would start/end in the wrong place. While the opening hasn’t been as much of an issue with my current manuscript, I definitely started in the wrong place with my earlier efforts. With this WIP, I had more of an ending issue. There was this cliffhanger I really wanted, so I decided to run it past my first round of readers. I knew better. But that’s why I need them–they resoundingly confirm the gut feelings I ignore. … I wouldn’t go deep enough with my characters. This is true on multiple levels. In my early drafts, I never go deep enough with the emotion, and I never make things hard enough on my main characters. I think it’s another one of those blinders we have in our own writing. I know what’s going on in the character’s head, what she’s feeling, but I have to get it down on the page so the reader gets it, too. As for going easy on them, even when I think I’ve really put the MC in an impossible situation, it’s never enough the first time around. Maybe I’ll figure that out someday! … my descriptions wouldn’t be clear enough. I don’t know if this is a problem with everyone or if it’s just because of the premises I choose to write (a girl sucked into the music, twins seeing through each others’ eyes), but I often have to go back and explain what’s happening more clearly. I certainly don’t nail my descriptions on the first try. My CPs and betas help me figure out why those descriptions aren’t working so I know how to fix them. … the stakes wouldn’t be high enough. This goes back a bit to not going deep enough with the characters, but I also tend to write antagonists that are more in the background orchestrating things than confronting the MCs directly. Added to that, I usually don’t make the antagonist’s reasons clear enough. If you don’t get what the antagonist wants from the MC, it’s hard to identify with why the MC has to go against them. It’s a definite blind spot for me. It happens with every manuscript, but fortunately I have people who point it out so I can fix it! … the climax wouldn’t be as exciting. I often get to the climax and then let out a huge breath of relief. Yay! The MC won! Except usually I don’t make it big enough and get comments like “I wanted more.” So then I go back and expand it. On the plus side, I learn with every new manuscript. My first drafts have gotten progressively better. I’ve even eliminated some of the comments I got on earlier manuscripts. I’m sure I won’t ever eliminate all of them as we all have our blind spots, but I do know that without my CPs and beta readers, my manuscripts just wouldn’t be enough. So thank you to everyone who’s read for me in the past or will in the future. You make me a better writer, and I’m so grateful. 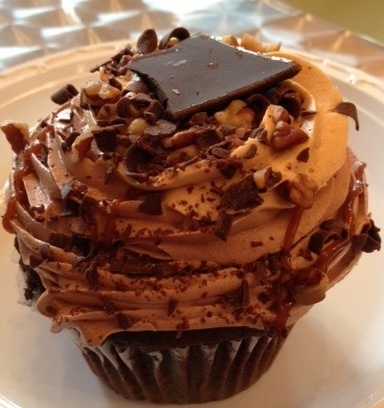 Have a cupcake on me! Do you ever hear advice and discard it because you don’t understand why you would do that? For me, one of those pieces of seemingly pointless advice was to read your work aloud. I didn’t understand what I would gain from an exercise that would take much longer than just reading the way I usually do. Well, last week I decided to try it. I can’t say it caused me to make sweeping changes. But I did figure out why it’s beneficial, and so I’m going to share my experience in case any of you are on the fence about reading aloud. Point of view. My work-in-progress is written in alternating points of view, so reading it aloud was extremely helpful in keeping those voices distinct. I noticed turns of phrase or words that sounded out of place for a particular character. For example, half of my WIP is set on another planet, so Earth-based metaphors wouldn’t be relevant there. When I heard the words in addition to seeing them, I could see more clearly that they didn’t fit the character. Dialogue. As with point of view, dialogue needs to be unique to each character. Often I would read something and think, “Character A wouldn’t say that, but Character B would,” or vice versa. And within a scene, I could tell if the characters sounded too similar. Repeated words. Although I have a pretty good eye for noticing repeated words or phrases, reading aloud helped in that I’d notice if I’d said something a lot. Maybe the phrases weren’t on the same page or even in the same chapter, but they were more noticeable out loud. I also caught a number of things I’d have one character think or say and then a different one would think or say something similar, so that repetition became a voice issue. Flow. Often things that look fine on the page don’t sound as strong when you say them out loud. Sometimes I’d read something that looked perfectly fine but sounded awkward. Even if the book is never read aloud to kids or put into audiobook form, I’d still like for it to flow. So, those are the benefits I discovered, and I’ll definitely do this again. Do you read your work aloud? What benefits have you discovered?